The St. Louis Cyclones are proud to announce the establishment of the St. Louis Cyclones Excellence in Sports Scholarship Fund. 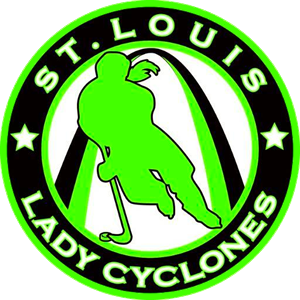 This fund was established to help assist and promote well rounded young female Cyclone hockey players who have exemplified excellent personal characteristics on and off the ice. 1) Each player may write a personal essay describing why they or another Cyclones player should be considered for a St. Louis Cyclones Excellence in Sports Scholarship award. 2) Head or Assistant Coaches may nominate players with a brief summary describing why a certain player should be considered for a scholarship award. 3) The Board of directors may nominate certain Cyclones players based on overall personal or player accomplishment in and around the local hockey community. A player's GPA, Sportsmanship, school attendance record, personal character, community volunteer hours, leadership on and off the ice, are several examples of the qualities the Board of Directors, Cyclone Coaches, and the Players themselves will be considering when nominating players for the St. Louis Cyclones Excellence in Sports Scholarships. The Board of directors will have final say in who is awarded scholarships based on all the nominated players. Total number and size of the scholarships are dependent on the number of participants and total scholarship funds received. On behalf of The Board of Directors we thank you in advance for your support of the St. Louis Cyclones Excellence in Sports Scholarship Fund. We believe in supporting our players and honoring their personal achievements on and off the ice.